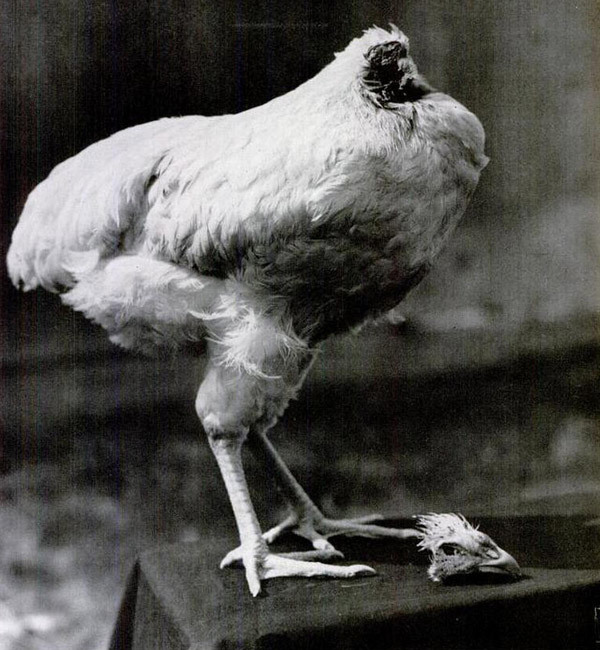 Mike the Headless Chicken - Lived 18 months without a head! 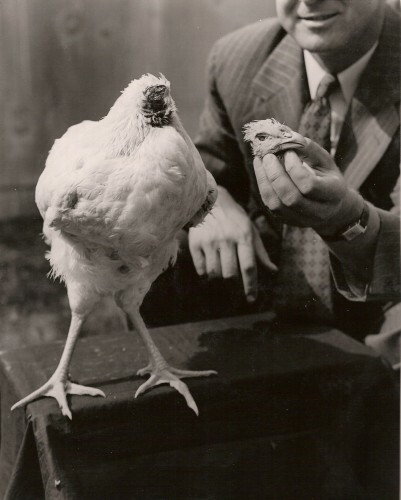 “Miracle” Mike the Headless Chicken (April 1945 – March 1947) was owned by farmer Lloyd Olsen of Fruita, Colorado. On September 10, 1945 Lloyd was sent out to the yard by his wife to get dinner. Lloyd swung the axe down on Mike and chopped the chicken’s head off. But much to his surprise, the chicken did not die. Mike was still able to balance on a perch and walk clumsily. He even attempted to preen and crow, though he could do neither. Olsen decided to continue to care permanently for Mike, feeding him a mixture of milk and water with an eyedropper. Once he got used to new and unusual center of mass, Mike could easily get himself to the highest perches without falling. His crowing, though, was less impressive and consisted of a gurgling sound made in his throat, leaving him unable to crow at dawn. Mike also spent his time preening and attempting to peck for food with his neck. Mike began touring with sideshows and was photographed for both Time and Life magazines. He was on display to the public for the admission price of twenty-five cents. At the height of his popularity, he was earning $4,500 a month. His success resulted in a wave of copycat chicken beheadings, but no other chicken ever lived more than a day or two. In March 1947, at a motel in Phoenix while traveling home from tour, Mike started choking in the middle of the night. The Olsens had inadvertently left their feeding and cleaning syringes at the sideshow the day before and were unable to save him. After Mike’s death, it was determined that the axe had missed the carotid artery and a clot had prevented Mike from bleeding to death. Although most of his head was severed, most of his brain stem and one ear were left on his body. Since basic functions (breathing, heart-rate, etc.) as well as most of a chicken’s reflex actions are controlled by the brain stem, Mike was able to remain quite healthy. “…if you eat meat…” says the chicken killer at the end. Well, therein lies the irony—not everyone thinks it is the human prerogative to eat the other denizens of the planet as a discretionary food item—I sure don’t. My 12 hens, 2 roosters and 4 ducks have a fine life being my companions and living to a ripe old age. As Mark Twain remarked—“It is just like man’s vanity and impertinence to call an animal dumb because it is dumb to his dull perceptions” Yep—man thinks awfully highly of himself in order to justify his bullying behaviors. I thought roosters crowed in the morning. Why would anyone want to cut the head off a rooster? WTF? This is disgusting. 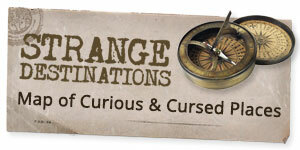 Fascinating, yes, but the height of animal cruelty in every form. Raising animals to eat is not animal cruelty…neither is swiftly cutting off a chickens head. Ever hear the story about the beagle who survived being euthanized and was given another chance to be adopted, rather than repeating the procedure? The same concept applies here, he tried to kill the chicken but the damn thing survived it so it got to live. So. goddamn. cruel. Is this, uh, true? Bizarre. Fun story, though. I went to Fruita on business and they have flyers about the town at the taco bell etc… and Mike is featured on them. I remember that we had a similiar event with a rooster when I was a kid. It didn’t live very long, 24 hours or less, but the fact that it di astounded me, even at an early age. New music video based on the amazing story of Mike the Headless Chicken, “Headless Mike” by the Radioactive Chicken Heads – http://www.youtube.com/watch?v=aUgPURW0qR8 Long live Mike! !